Enjoy the pear tree above, our harvest moment. Here is WFMU's September Song archive from a few years ago. A selection of these are getting heavy rotation at the moment, but I'll have to stop tomorrow. Favourites: Charles Mingus, Harry James, James Brown, Lee Hazlewood, Santo & Johnny. A recent issue of Monocle magazine told me that Munich is "sometimes referred to as 'Italy's northernmost city'". Then I saw these delightful photos from the beginning of this year's Oktoberfest, in all its Germanic glory. Speaking of children's books, here is a passage from "Storyteller: The Life Of Roald Dahl" by Donald Sturrock, published earlier this month. 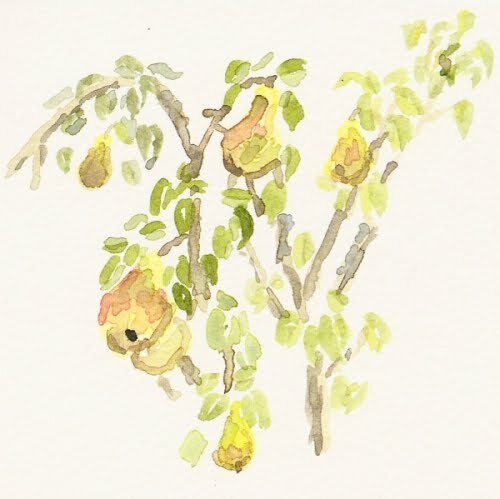 Roald Dahl's approach to storytelling is an inspiration: much of it is true of illustration, not only for children but for adults. The most entertaining, illuminating and memorable pictures capture the viewer in the same way that Roald Dahl engaged the reader. I've transcribed this section from Book Of The Week on Radio 4. His publisher, Alfred Knopf, had been far-sighted when, in the mid-1960s, he described Dahl as "one of the wizards; one of the wonder-men of this age". Twenty years later the middle-aged wizard had become the grand old master of his craft. He knew how to shock; he knew how to scare; he knew how to keep the reader on the edge of their seat with excitement. He knew how to make them smile and how to make them roar with laughter. His "passionate purpose", as he described it, had become to teach children "to be comfortable with a book - and to read a book". He wanted to take them out of their everyday environment, filled with chores and schoolwork and to lift them into some kind of "marvellous, funny or incredible place". He was proud of being the voice of youth in a world that sometimes seemed to despise children, much as it seemed to despise him. Only a couple of months before he died he jotted down some notes for a lecture. To children, he reflected, grown-ups were giants and consequently all these people, whether it is the mother or the father or the teacher, were subconsciously the enemy. This fact is not generally realised by adults. When I write a book which vilifies parents or teachers, eg. "Matilda", children absolutely love it. This is because the children shout "Hooray! Here at last is a grown-up who understands what it's like to be one of us." He had outlined this philosophy more than ten years earlier in an article that reads almost as a manifesto for his craft. "D'you know what I feel like?" said the big crocodile to the smaller one. "I feel like having myself a nice, plump, juicy child for my lunch." They love that sort of thing. What else do they love? New inventions; unorthodox methods; eccentricity; secret information. The list is long, but above all, when you write a story for them, bear in mind that they do not possess the same power of concentration as an adult and they become very easily bored or diverted. Your story therefore must tantalise and titillate them on every page and all the time that you are writing you must be saying to yourself "Is this too slow? Is it too dull? Will they stop reading?". To those questions you must answer "yes" more often than you answer "no". If so, you must cross it out and start again. Alright, it's not what you thought. 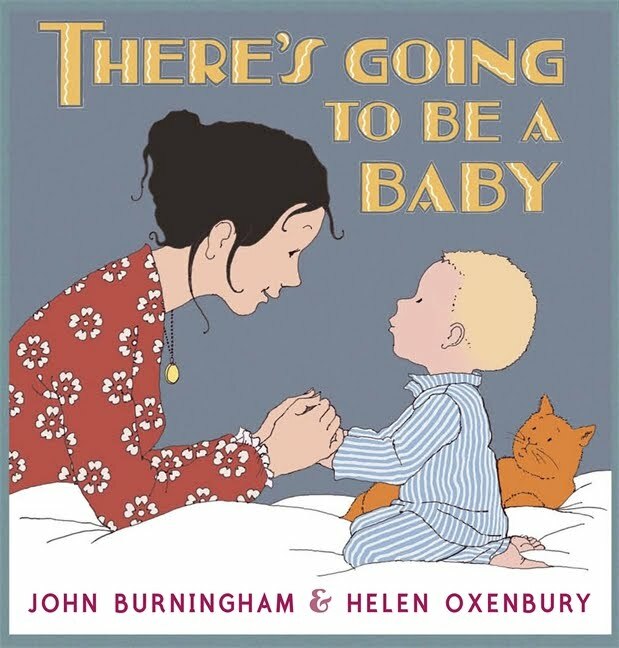 I just switched the radio on and heard that Women's Hour tomorrow will include the children's illustrators Helen Oxenbury and John Burningham. 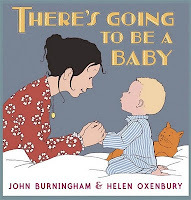 They'll be talking about "There's Going To Be A Baby", their first picture book together after decades of marriage. I've been looking forward to it since a visiting lecturer from Walker Books showed us some of the pages back in January or February. It looks completely wonderful. Bankside is a contrast to the grand galleries. Instead of season-long tableaux of artistic titans, Bankside puts on short exhibitions that show the pulse of creativity. The gallery is a platform for a huge number of contemporary artists, so the displays really must change frequently. Even so, despite a run of only eleven days, London Lives, the top selection of a competition, was a dense and bristling collection of a hundred artists' submissions. That amount and wealth of work is what allows the show to represent London: a hundred aspects of the city and its surroundings. That variety allowed different media and different emphases to complement each other, capturing not only the timeless destination-views of the capital but the passing atmospheres of busy, changing streets. Only a week before the Pope's visit to London, the V&A's Raphael Court was augmented with this exhibition of tapestries commissioned for the Sistine Chapel in the Sixteenth Century. The notes accompanying the display make the power games of the Vatican today look transparent and unbiased by comparison to the manoeuvres of the Medici. The selection of Biblical scenes for the chapel leant towards those that "reinforced the authority of the papacy" - ie. scenes of St. Peter, St. Paul and the early church. The tapestries correspond to the cartoons (full-scale painted draughts on paper) that are on permanent display at the V&A (on loan from the royal collection after centuries at Hampton Court Palace since Charles I acquired them in Brussels before his ascension). In some places an additional painted copy is shown alongside. I found the most engaging part of the exhibition in comparing the sketches, cartoons, painted copies and interpretations by tapestry artists. Colours that work well in paint were swapped for ones that stand out better in fabric; extra space was given to craftsmen who excelled at foliage or wildlife. The larger changes range from the theologically significant (Christ's position and gesture in "Christ's Charge To Peter") to the mildly-entertaining (on the tapestry Christ's white toga, unlike the cartoon, is covered in little golden suns). A case of sketches shows preparatory drawings of models making the same scene in everyday Renaissance dress. Collectors in the Eighteenth and Nineteenth Centuries admired Renaissance artists' ability to "tell their story plainly". Raphael's images were revered for their "clear, dramatic narrative". The drama and dynamism are in fact souped up in the explosive stupification of onlookers at "The Death Of Ananias" and the fishermen straining at the nets in "The Miraculous Draught Of Fish". The effect of all of this is spoiled when visitors turn to see the "Retable of St George", one of the permanent fixtures in the room: a magnificently painted and gilded altar screen demanding closer inspection. Very soon they recoil in horror when they see a few few moments of piety and triumph overwhelmed by a series of increasingly gruesome ways to die. It's fascinating and it's horrible. Muybridge is best known for his photographic studies of humans and animals in motion: multi-angle series of shots of, say, a woman walking down a set of steps and turning; or the image that proved that a horse can have all four hooves in the air in the course of galloping. I heard visitors announcing to each other "This is what we've come for" when they reached zoopraxiscopes and zoetropes (the contraptions that animated these series) two thirds of the way through this exhibition. Like me, they probably remember their inclusion in childhood books of experiments. Moving or 3D images are inately entrancing to us (remember the arrival of magic-eye pictures), but it is clear how, in the 1870s and 80s, Muybridge advanced cinematography, zoology and figure-drawing. The preceding few rooms show the continuation from his ground-breaking work in photography - both the art and the technology. An Englishman in America, Muybridge (who frequently revised his name and identity) was keen to make the most of the newest arenas. His single-mindedness (which may have lead to some questionable ethical and moral choices, leaving aside the accusation of murder) and innovation are clear even today and his travels result in a document of American expansion in the second half of the 19th century, complete with Indians and Chinamen. The daring and sometimes mind-bending views of Yosemite and San Francisco (I spent some time working out which way up the book should be, with another visitor) convey the wonder and the lure of both the American landscape and its new towns. It's not just because I've been there that these settings make the later images of Panama and Guatemala look quaint, despite their theatrical poise and precision. Although the first few rooms hop about in the artist's chronology, they all lead up to the big draw, the high-tech experiments involving rapid-fire work with multiple cameras, prefiguring Matrix-style "bullet-time". He tried everything: analysing the movement of people with physical impairments; wrestling; splashing about in tubs of water; getting into bed and, most amusingly, a woman in a full Victorian dress and a large hat, leaping over a stool. The camera's ability to stop time and to split a subject into multiple angles (a trick replicated for visitors with a clever glass wall at the entrance and exit) proved what the eye couldn't see and still struggles to believe. I can't imagine a more opposite artist to have printed on the same ticket and exhibited just through a wall or two from the Muybridge show. In the work of Rachel Whiteread it is the spaces that are captured and frozen; arenas of human activity are rendered monumentally still; busyness countered with contemplation. Throughout this Autumn, Tate Britain hosts a fairly conventional appreciation of Eadweard Muybridge right next to this smaller (and cheaper) exhibition showing the byproducts or sideline of Whiteread's immense public sculptures: her sketches, drawings and doodles. Some pieces show visual preoccupations that fed into full-scale work; some are simply intriguing by showing Whiteread's playful experiments with line; some show the construction behind specific works such as the Holocaust Memorial. It's informal but technical, and accomplished despite being created without display in mind, but has no real conclusion. I'm not sure that the organisers know what to do with a collection that is neither a body of related work nor a progression of complete statements, but a scrapbook of a journey that isn't yet finished. These two shows are running at Tate Britain from 8th September 2010 to 16th January 2011. Extra marks to the Tate for the A6 exhibition guides. On the subject of Yosemite, let's compare Eadweard Muybridge at Mariposa Grove in 1872 to my sister at Mariposa Grove in 1998. I've been debating whether it's the same tree.